Earlier this week, I talked a little about roasting vegetables for a quick way to get a wide variety of vegetables in my meals. 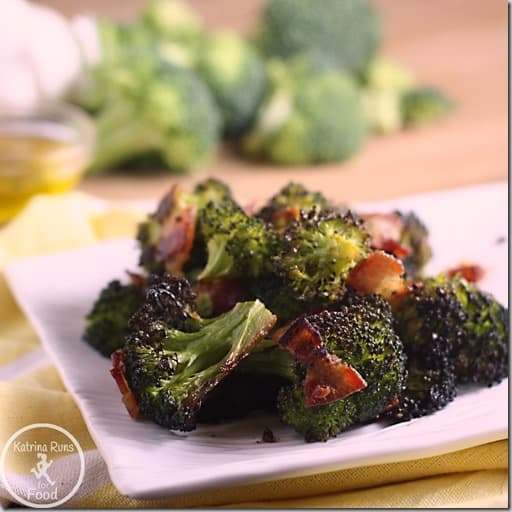 One of my favorite vegetables for the oven is broccoli. Roasting brings out a unique sweet flavor that is often missed when steaming or boiling. When I added bacon to the mix, well, this is just too good to keep to myself. I found this recipe from Michelle over at Nom Nom Paleo. She is a paleo and Whole 30 fanatic in the kitchen! Plus, she deeply understands my love for bacon with almost everything. For this recipe, I used just the florets and I minced my garlic. In a plastic storage bag, add broccoli, garlic, bacon, oil, and salt/pepper. Shake vigorously until well coated. Spread onto baking pan and spread florets until they are all in single layer. Roast 30 minutes, shaking and flipping vegetables at 15 minutes. These are great right out off the pan. If you can wait for the rest of the meal, I like this with baked salmon, roasted chicken, or side by side with a stuffed pork tenderloin. Is the bacon cooked before you put it in the oven or is it raw? No, it is raw. I checked over at the original site that she borrowed this from….